The Dogs Will Bark But the Caravan Marches on…This telling parable was shared with me quite a few years ago while talking with the Egyptian Minister of Agriculture about food…the lack of it as well as the technological advancements that would feed the world. He embraced the idea of aquaponics but warned of the impending backlash of a new technology with so much potential. He warned us of the naysayers and encouraged us to stand tall and be confident in what we were doing; be confident that we could and would make a difference, despite the vocal crowd who displays jealousy that others are achieving what they cannot. A recent string of negative, ugly banter on Facebook about our company recently brought that conversation back to me with extreme clarity. A small group of misinformed people can do a lot of damage when they attack with no warrant. The comments of this particular group of individuals was so far from reality, that a public reply is appropriate. The comments address the patents that Nelson and Pade, Inc.® has been issued for the design and methods of our Clear Flow Aquaponic Systems® with ZDEP.® No, we didn’t patent aquaponics. We would never attempt that and it would not be allowed if we did. Most of the early research in aquaponics was funded by the US Government and can be traced back to Dr. James Rakocy and his associates at the University of the Virgin Islands (UVI). We always credit Dr. Rakocy for his work and contributions to this industry. I respect him and will always hold him in the highest regard. In short, we did not patent the UVI aquaponics system. We engaged in many years of self-funded research to develop aquaponic systems and methods that grow more food than the original research designs. This we achieved. We’re not resting, though. We continue to advance our mission of food security through our technology. Our Clear Flow Aquaponic Systems® with ZDEP® and our methods grow 6-8 times more vegetables than the UVI systems did, all with the same feed input. We applied for and earned the patents because of these advancements. In every industry, the innovators advance the technology and patents are granted for designs and methods that are truly unique. Patents are not granted for things that have been already done. Currently, Nelson and Pade’s Clear Flow Aquaponic Systems® are installed in 25 countries and nearly all 50 states. We have had people from 96 countries travel to our world-class aquaponics training facilities for our Aquaponics Master Class.® We offer long-term technical support to our customers that is second to none. We have developed a private-public partnership with the University of Wisconsin. Through that partnership we have shared our knowledge, experience and technology to create new educational opportunities and advance the research in aquaponics to a level that Dr. Rakocy only dreamed of, such as identifying beneficial bacteria through DNA testing to create even more efficient systems. We do this because we believe aquaponics can change the face of agriculture, can change the face of nutrition and can help to eliminate starvation around the world. We wish all of the aquapreneurs the best of luck in their endeavors. If you want to do aquaponics, go for it. If you want to build and sell systems, more power to you. But if you want to copy what Nelson and Pade has developed and patented, in an effort to profit from it, you will hear from our attorneys. Simple as that. We will continue to take the high road. We are proud of what we have achieved and what we do every day: providing people with the tools, technology and support that they need to get started and be successful in aquaponics. 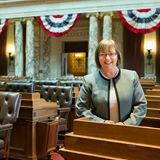 Wisconsin State Representative Joan Ballweg visited our state-of-the-art facility during our August, 2016 Aquaponics Master Class®. She joined us for lunch, featuring our freshly harvested leafy greens and tilapia and had the opportunity to chat with Rebecca Nelson and John Pade as well as a few of our attendees. Representative Ballweg featured Nelson and Pade, Inc.® in a video. Thank you for your continued support and all that you do. We look forward to your next visit! After just returning from a whirlwind trip and wonderful celebration of NOAH’s (Native Oklahoma Aquaponic Harvest) grand opening in Vian, Oklahoma, I have a few moments to reflect on the experience, people and hope that this trip provided. Going back to 2010, Richard Tyler, now the proud owner of an aquaponic farm, called to inquire about our Clear Flow Aquaponic Systems®, training and support. Richard wasn’t quite ready to move forward, but he was confident that day would come. One of the driving forces in Richard’s desire to efficiently and sustainably grow fish and vegetables was the need in his mostly Native American community for fresh, nutritious food. Richard had witnessed massive job losses and more and more people unable to feed their families. Emotionally moved, Richard started a food bank to help his community, always with the vision that his aquaponic farm would someday do the same. The food bank grew as the community needs grew, eventually feeding hundreds of people every day. Following both personal struggles and hard-won victories, Richard was determined to make his aquaponics farm happen. In 2014, without funds in hand to achieve this, he turned to the USDA and FSA. His first call was to Dexter Pearson, a USDA Advisor specializing in rural development. Dexter understood the potential of what Richard wanted to achieve and connected him with local FSA Agent, Steve Molloy. Throughout the entire process, Mr. Pearson provided assistance, input and support. Steve Molloy was able to assist Richard with guidance on loans available through the FSA for land purchase, upfront equipment costs and installation, plus start up operating capital. The process was new to Steve but, with willingness from the FSA to embrace sustainable agriculture and aquaponics, he was able to put together a viable loan package. This helped the Oklahoma FSA establish protocols for funding aquaponic farms that include requiring a proven system design, comprehensive training and long-term grower support…a perfect fit for Nelson and Pade, Inc.® Clear Flow Aquaponic Systems®. In May 2015, Richard attended our Aquaponics Master Class®, grinning ear-to-ear as his dream of owning and operating an aquaponics farm was beginning to come true. He had preliminary approval on the FSA loans and he was at the class to continue learning about his new career. By the fall of 2015 the loan was completed and the nearly 10,000 sq. ft. greenhouse and 6-500 Clear Flow Aquaponic System® were ordered. January of 2016 brought Richard, his son Logan and wife Jackie to the Nelson and Pade, Inc.® business campus in Montello, Wisconsin for their Extended Stay Learning Program. NOAH’s greenhouse construction was underway and the aquaponic systems were being built by our team of technicians. Spring saw the completion of the greenhouse and assembly of the systems and by early-summer, everything was built, fish were stocked and the first twinge of green was emerging from the plant beds. The grand opening was a two-day event. USDA’s Dexter Pearson flew in from Washington DC, I travelled from Wisconsin and individuals from Oklahoma, Texas, Louisiana and other states were in attendance. The focus of Thursday was an informational workshop with talks from government agencies, funders and myself. 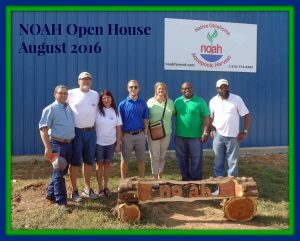 Friday was a celebration of the opening of the NOAH aquaponics farm. Tribal leaders, government representatives, newspapers, potential growers and curiosity seeks were all eager to attend the open house and see the Clear Flow Aquaponic Systems® in action. The excitement was contagious as people realized that this one farm is the beginning of something much larger. A network is now in place to assist other individuals who want to get started in aquaponics. With help from the USDA, a cooperative is being planned to assist individual farmers in Oklahoma with marketing and organization. Richard’s dream of an aquaponic farm helping to feed his community is now a reality, one that will grow and thrive, providing high quality, nutritious food to many people. As Richard mentioned during a talk at the open house, it truly took a community to build this farm…a community that included the USDA, FSA, state representatives, Nelson and Pade, Inc.®, friends and neighbors from near and far. For anyone who has a dream to build an aquaponic farm, have hope that it is not just possible, but probable. Hurdles can be overcome; funding can be found. With the support shown for this farm as well as others, the USDA and FSA have demonstrated a commitment to and support of aquaponic farming. The requirements include having a proven system, training and support. We are here to provide that for you in the same way we have for NOAH farm. Feel free to call (608-297-8708) or email us (info@aquaponics.com) for more information on how you can get started with a commercial aquaponic farm.